Horror Tree – my story is a leaf on its trunk…. Stuart was really supportive and sent a nice helpful email back suggesting some minor edits- I notice his own horror tales are appearing in anthologies currently quite a lot. The spooky tale is partly inspired by the grand old hotel of that name in Liverpool, where my mum used to go dancing in the 1950’s. Thereafter my imagination took over as to what is lurking in the basement! Above is the photo Stuart chose to go with the story. I also enjoy horror films- watched low budget B zombie film ‘The Rezort’ starring Dougray Scott (who had about 5 lines of dialogue to mumble and was clearly there for the free holiday in the Canaries) but hey- it was surprisingly creepy and effective. World War Z writ small. It’s been half term- trips to IKEA/Go Outdoors etc dominated but I’ve also done some editing and rewriting and submitted to :-Bridge and Tunnel books/on the premises comp/For Books’ Sake ghosts anthology call out/ and Three Drops from the Cauldron Beltane anthology call. I won 2nd place in Morgen Bailey’s https://morgenbailey.wordpress.com/ 100 word comp a little while back and she offered a prize of editing 1500 words of a piece of my work. Feedback is so useful and worth having. So I sent in my new short story, ‘Hospital Blues’, a ghost story set in Bingley (where I live) in both the modern day and back in WW1. The title has double meanings- it refers obviously to how folks feel when they’re in hospital, how the girl in the story feels about her life and it’s also a reference to the uniform injured WW1 soldiers were issued with! Clever huh! I have entered my own ‘bold’ themed poem- as I did for Huddersfield Literature Festival poetry comp (deadline has now passed for that one). I still write the occasional poem- my latest was a riff on Film noir and its P.I.’s and femme fatales. and rewriting a longer story based around the derelict old hospital in Bingley,which is set in the town and there are hauntings and ghosts …..’Hospital Blues’ is the title. My copy of the Otley writers book, The Pulse of Everything has arrived- and it looks very impressive. A great looking read. Real life calls this week (as opposed to my fictional one) with trips to IKEA and decorating and other jobs. Would you like to update product info? for all you romantics out there. A fun twist in the tale 200 worder- so it will fit on a postcard, remember them? Ah retro moment. Annie Evett has emailed to say that Twisted Tales 2016 Edition nearly set to go to print- from Raging Aardvark as both a print and e book. I will be reviewing her Flash fiction collection next week- formally- but I’ve already read some of Allison’s work and she is excellent- snapshot stories to read on the move. Three of the SWG members have a book launch event happening on Friday March 10 at Otley Courthouse 6.30pm for the group’s anthology ‘The Pulse of Everything’- Each member will read a short extract from their work. http://litfestprogramme.blogspot.co.uk/ has information on Headingley Literature Festival happening from Fri February 10, with events happening in the following months. University of Leeds at Trinity in Horsforth as its annual writers’ day on Wednesday March 22 which is filled with workshops and speakers. I’ve had a bit of a dry quiet spell writing wise not life wise- with a flurry of rejections for my short stories from a few mags (on line). One editor was probably trying to be encouraging when he replied- ‘Thanks for submitting three pieces. Not bad. Not for us at this time, but keep writing. You work shows promise.’ However I had rather hoped that my work had risen above the ‘not bad’ level by now! And that my ‘promise’ was rather more developed. Oh the slings and arrows to our egos. However Annie Evett of indie Australian Press Raging Aardvark http://ragingaardvark.com got in touch with all us Flash Fiction authors who are going to be in Twisted Tales 2016/7 after a long silence to say – hurrah!- the book is back on and will be out in February- or soonish. This is great news. 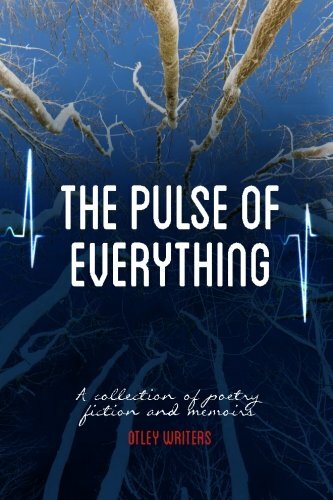 My WEA Otley writing group have announced the launch of their book, The Pulse of Everything. Friday March 10th at Otley Courthouse. I have some pieces of Flash in the anthology which several of the members have worked very hard to put together. Editor Stuart Conover of the Horror Tree blog http://horrortree.com/ has accepted my short story, The Adelphi for publication on his site. This is a longer piece than Flash length and Stuart asked me to do some minor rewrites for it. I am of course nothing but the Queen of Rewrites- so I made some changes and now he is happy to publish it. I follow the Horror Tree site regularly and use them as a useful resource for entering my fiction to horror mags. Well worth checking out. Allison writes creepy dark pieces (remind you of anyone?) and I had come across her fiction on line where she’s sometimes entered the same comps as me, but she’s usually done considerably better than moi! She is a really talented writer and well worth a read. Chapeltown Books have been looking to sign authors with Flash Fiction collections and I have followed in Allison’s steps and signed a contract with Gill James for my own collection to come out in April, both as a print book and an e-book. This is amazing news and I was/am so delighted. I have written more pieces of Flash in the last 18 months or so than I realised and collating the majority of them all was fantastic and useful. Once the book is out there will be some PR/marketing/school visits/begging and pleading to buy it from me- so it will keep me occupied.